In Section 6.2, ‘A short history of educational technology‘, the development of different media in education was outlined, beginning with oral teaching and learning, moving on to written or textual communication, then to video, and finally computing. Each of these means of communication has usually been accompanied by an increase in the richness of the medium, in terms of how many senses and interpretative abilities are needed to process information. Another way of defining the richness of media is by the symbol systems employed to communicate through the medium. Thus textual material from an early stage incorporated graphics and drawings as well as words. Television or video incorporates audio as well as still and moving images. Computing now can incorporate text, audio, video, animations, simulations, computing, and networking, all through the Internet. 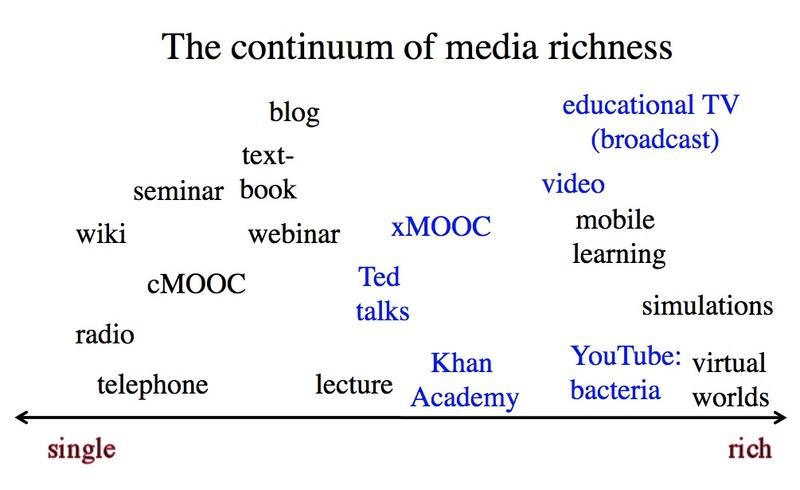 Once again then there is a continuum in terms of media richness, as illustrated in Figure 6.6.2 above. Also once again, design of a particular medium can influence where on the continuum it would be placed. For instance in Figure 6.6.2, different forms of teaching using video are represented in blue. Ted Talks are usually mainly talking heads, a televised lecture, as are often xMOOCs (but not all). 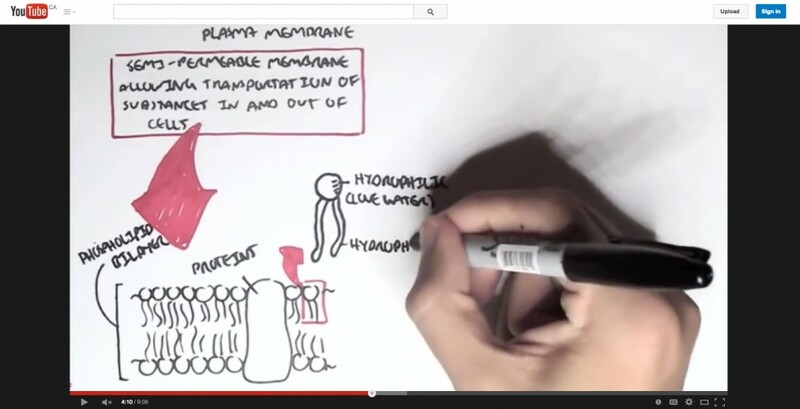 The Khan Academy uses dynamic graphics as well as voice over commentary, and Armando Hasudungan’s You Tube video on the structure of bacteria uses hand drawings as well as voice over commentary. Educational TV broadcasts are likely to use an even wider range of video techniques. But how rich should media be for teaching and learning? From a teaching perspective, rich media have advantages over a single medium of communication, because rich media enable the teacher to do more. For example, many activities that previously required learners to be present at a particular time and place to observe processes or procedures such as demonstrating mathematical reasoning, experiments, medical procedures, or stripping a carburetor, can now be recorded and made available to learners to view at any time. Sometimes, phenomena that are too expensive or too difficult to show in a classroom can be shown through animation, simulations, video recordings or virtual reality. Furthermore, each learner can get the same view as all the other learners, and can view the process many times until they have mastery. Good preparation before recording can ensure that the processes are demonstrated correctly and clearly. The combination of voice over video enables learning through multiple senses. Even simple combinations, such as the use of audio over a sequence of still frames in a text, have been found more effective than learning through a single medium of communication (see for instance, Durbridge, 1984). The Khan Academy videos have exploited very effectively the power of audio combined with dynamic graphics. Computing adds another element of richness, in the ability to network learners or to respond to learner input. From a learner’s perspective, though, some caution is needed with rich media. Two particularly important concepts are cognitive overload and Vygotsky’s Zone of Proximal Development. Cognitive overload results when students are presented with too much information at too complex a level or too quickly for them to properly absorb it (Sweller, 1988). Vygotsky’s Zone of Proximal Development or ZPD is the difference between what a learner can do without help and what can be done with help. Rich media may contain a great deal of information compressed into a very short time period and its value will depend to a large extent on the learner’s level of preparation for interpreting it. For instance, a documentary video may be valuable for demonstrating the complexity of human behaviour or complex industrial systems, but learners may need either preparation in terms of what to look for, or to identify concepts or principles that may be illustrated within the documentary. On the other hand, interpretation of rich media is a skill that can be explicitly taught through demonstration and examples (Bates and Gallagher, 1977). Although YouTube videos are limited in length to around eight minutes mainly for technical reasons, they are also more easily absorbed than a continuous video of 50 minutes. Thus again design is important for helping learners to make full educational use of rich media. 6.6.4 Simple or rich media? the rich medium may be inappropriate for the learning task. For instance, if students are to follow and critique a particular argument or chain of reasoning, text may work better than a video of a lecturer with annoying mannerisms talking about the chain of reasoning. In general, it is tempting always to look for the simplest medium first then only opt for a more complex or richer medium if the simple medium can’t deliver the learning goals as adequately. However, consideration needs to be given to media richness as a criterion when making choices about media or technology, because rich media may enable learning goals to be achieved that would be difficult with a simple medium. Activity 6.6 How rich is your medium? 3. Do you agree with the placement of different media on this continuum in Figure 6.6.2. If not, why not? 6.6 Media richness by Anthony William (Tony) Bates is licensed under a Creative Commons Attribution-NonCommercial 4.0 International License, except where otherwise noted.